Whole Earth Sweetener Co.’s natural sweetener gives OCS operators an opportunity to offer customers a product containing no fructose and zero calories. The most important feature of Whole Earth Sweetener is that it uses a sweetener derived from plants – stevia and monk fruit, said Kelly Brennan, senior manager of foodservice sales at Merisant Co., the parent company of Whole Earth Sweetener Co. There are no calories or sugar, and the product delivers a clean, sweet taste. The product does not “clump” when added to a beverage, but dissolves evenly. Whole Earth is available through many OCS distributors and roasters, including Vistar, Essendant (formerly known as United Stationers) and BK Miller. While more consumers are choosing natural sugar substitutes, there are not as many options for them away from home, which creates an opportunity for OCS operators. The OCS industry has gradually embraced the product since the launch, Brennan said. While it is a little more expensive than artificial sweeteners because of the ingredients (e.g., stevia and monk fruit extracts), it does well at OCS locations as it gives many of their consumers the desired natural sweetener option they want when they are away from home. Brennan noted that Whole Earth is the first and only natural sugar substitute in all of Starbucks across the U.S. and Canada. Whole Earth sweeteners are also environmentally friendly, containing less packaging material. The packet size has been reduced by 12 percent, the carton size by 14 percent and case corrugate by 4 percent. The company uses 100 percent recycled paperboard. By decreasing package weight, shipping has been made more efficient. The paper packets are 6 percent lighter than foil packets. Stevia sweeteners continue to gain market share over other sugar substitutes, having posted a 7 percent compound annual growth revenue increase in a recent three-year period. 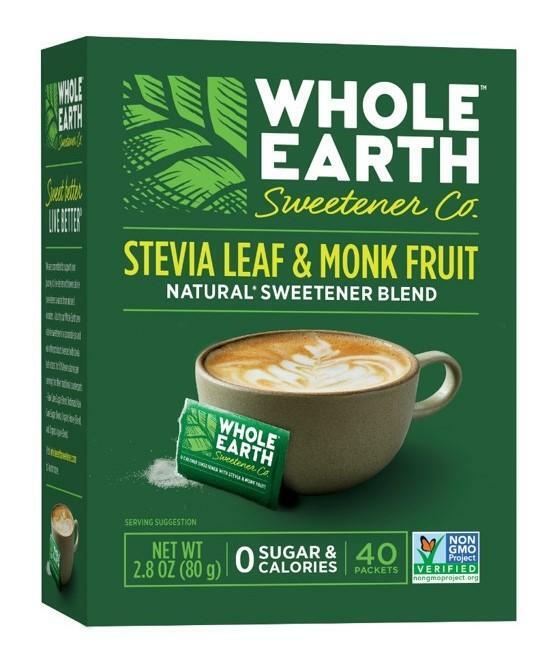 Whole Earth’s Stevia & Monk Fruit Liquid Sweetener contains no calories, no preservatives, no alcohol, no artificial flavors, no artificial colors and no GMO ingredients. The product comes in original, vanilla and raspberry flavors. While only 16 percent of the Stevia business, Liquid Stevia delivered a 36 percent annual growth in a recent 52-week period, the company reported. Whole Earth’s Stevia Leaf & Monk Fruit Cubes offer natural zero calorie sweetness cubes in a convenient, recyclable metal tin. The product is gluten-free and Non-GMO Project Verified.